Commonly used moderators include regular (light) water (roughly 75% of the world's reactors), solid graphite (20% of reactors) and heavy water (5% of reactors). Beryllium has also been used in some experimental types, and hydrocarbons have been suggested as another possibility. Neutrons are normally bound into an atomic nucleus, and do not exist free for long in nature. The unbound neutron has a half-life of just about 10 minutes. The release of neutrons from the nucleus requires exceeding the binding energy of the neutron, which is typically 7-9 MeV for most isotopes. Neutron sources generate free neutrons by a variety of nuclear reactions, including nuclear fission and nuclear fusion. Whatever the source of neutrons, they are released with energies of several MeV. the characteristic neutron temperature of a several-MeV neutron is several tens of millions of degrees Celsius. Moderation is the process of the reduction of the initial high kinetic energy of the free neutron. Since energy is conserved, this reduction of the neutron kinetic energy takes place by transfer of energy to a material known as a moderator. It is also known as neutron slowing down, since along with the reduction of energy comes a reduction in speed. Some nuclei have larger absorption cross sections than others, which removes free neutrons from the flux. Therefore, a further criterion for an efficient moderator is one for which this parameter is small. The moderating efficiency gives the ratio of the macroscopic cross sections of scattering, , weighted by divided by that of absorption, : i.e., . For a compound moderator composed of more than one element, such as light or heavy water, it is necessary to take into account the moderating and absorbing effect of both the hydrogen isotope and oxygen atom to calculate . To bring a neutron from the fission energy of 2 MeV to an of 1 eV takes an expected of 16 and 29 collisions for H2O and D2O, respectively. Therefore, neutrons are more rapidly moderated by light water, as H has a far higher . However, it also has a far higher , so that the moderating efficiency is nearly 80 times higher for heavy water than for light water. In a thermal nuclear reactor, the nucleus of a heavy fuel element such as uranium absorbs a slow-moving free neutron, becomes unstable, and then splits ("fissions") into two smaller atoms ("fission products"). The fission process for 235U nuclei yields two fission products, two to three fast-moving free neutrons, plus an amount of energy primarily manifested in the kinetic energy of the recoiling fission products. 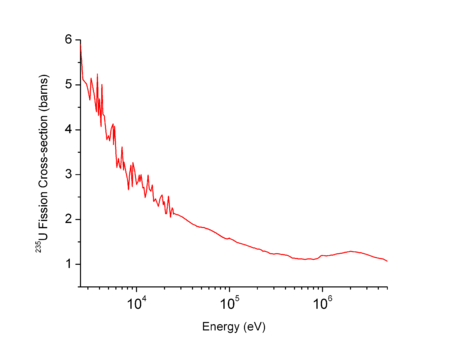 The free neutrons are emitted with a kinetic energy of ~2 MeV each. Because more free neutrons are released from a uranium fission event than thermal neutrons are required to initiate the event, the reaction can become self-sustaining — a chain reaction — under controlled conditions, thus liberating a tremendous amount of energy (see article nuclear fission). The CANDU reactor's moderator doubles as a safety feature. A large tank of low-temperature, low-pressure heavy water moderates the neutrons and also acts as a heat sink in extreme loss-of-coolant accident conditions. It is separated from the fuel rods that actually generate the heat. Heavy water is very effective at slowing down (moderating) neutrons, giving CANDU reactors their important and defining characteristic of high "neutron economy." Early speculation about nuclear weapons assumed that an "atom bomb" would be a large amount of fissile material, moderated by a neutron moderator, similar in structure to a nuclear reactor or "pile". Only the Manhattan project embraced the idea of a chain reaction of fast neutrons in pure metallic uranium or plutonium. Other moderated designs were also considered by the Americans; proposals included using uranium hydride as the fissile material. In 1943 Robert Oppenheimer and Niels Bohr considered the possibility of using a "pile" as a weapon. The motivation was that with a graphite moderator it would be possible to achieve the chain reaction without the use of any isotope separation. In August 1945, when information of the atomic bombing of Hiroshima was relayed to the scientists of the German nuclear program, interned at Farm Hall in England, chief scientist Werner Heisenberg hypothesized that the device must have been "something like a nuclear reactor, with the neutrons slowed by many collisions with a moderator." After the success of the Manhattan project, all major nuclear weapons programs have relied on fast neutrons in their weapons designs. The notable exception is the Ruth and Ray test explosions of Operation Upshot–Knothole. The aim of the University of California Radiation Laboratory design was to produce an explosion powerful enough to ignite a thermonuclear weapon with the minimal amount of fissile material. The core consisted of uranium hydride, with hydrogen, or in the case of Ray, deuterium acting as the neutron moderator. The predicted yield was 1.5 to 3 kt for Ruth and 0.5-1 kt for Ray. The tests produced yields of 200 tons of TNT each; both tests were considered to be fizzles. Hydrogen, as in ordinary "light water." Because protium also has a significant cross section for neutron capture only limited moderation is possible without losing too many neutrons. The less-moderated neutrons are relatively more likely to be captured by uranium-238 and less likely to fission uranium-235, so light water reactors require enriched uranium to operate. Carbon, in the form of reactor-grade graphite or pyrolytic carbon, used in e.g. RBMK and pebble-bed reactors, or in compounds, e.g. carbon dioxide . Lower-temperature reactors are susceptible to buildup of Wigner energy in the material. Like deuterium-moderated reactors, some of these reactors can use unenriched natural uranium. ↑ Miller, Jr., George Tyler (2002). Living in the Environment: Principles, Connections, and Solutions (12th Edition). Belmont: The Thomson Corporation. p. 345. ISBN 0-534-37697-5. 1 2 3 Stacey., Weston M (2007). Nuclear reactor physics. Wiley-VCH. pp. 29–31. ISBN 3-527-40679-4. 1 2 3 Dobrzynski, L.; K. Blinowski (1994). Neutrons and Solid State Physics. Ellis Horwood Limited. ISBN 0-13-617192-3.